According to somebody I've never met before -- or ever will -- when someone places a mask over their own face; this shrouded act is meant to represent the following 74 minute movie made in 1984. It was Directed by: Roy Ward Baker; and Starred: Peter Cushing, John Mills, Ray Milland, with Anne Baxter. On two consecutive yet separate occasions, two distinguished looking gentlemen have approached me at my Baker Street apartment, and asked me to investigate two very different crimes. Now the first crime was presented by my police liaison, Alec MacDonald (Gordon Jackson), and it involved the death of a poor unfortunate beggar who was washed up by the side of the River Thames. Whereas the second crime was at the bequest of the Home Secretary (Ray Milland), and this concerned the strange disappearance of a German prince, which could also cause great civil unrest between our two nations. Of course, me being the venerable Sherlock Holmes (Peter Cushing), I eventually decided to occupy my time with the second crime. The one involving the missing prince. 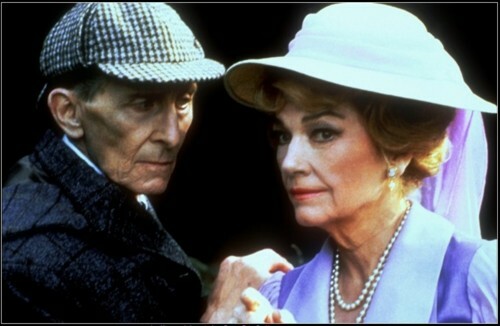 However, after I looked into this matter further and came into contact with one of my old adversaries, Irene Adler (Anne Baxter), I began to have second thoughts about my choice. Especially when I almost got blown to bits during my subsequent sleuthing! Nonetheless, that's most probably why what next transpires all goes 'choo-choo' when I catch a train ride to nowhere. As you can't trust everything you see - can you actually believe an old adversary - as per usual Doctor Watson (John Mills) comes to my aide - and at the end of the day, a devilish plot is ultimately swayed. 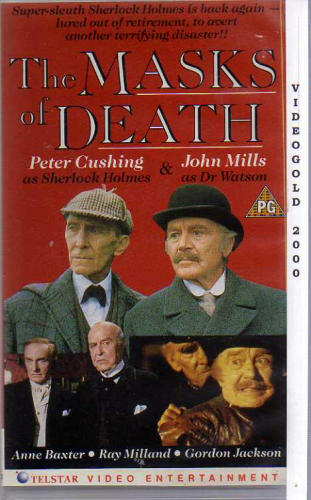 Now if you're able to look past the blatantly obvious 'made for television' quality 'The Mask of Death' has in spades, you'd find that at the very heart of it is a fairly well paced and intriguing Sherlock Holmes adventure. Honestly, dear reader! From my point of view the only thing that let this movie down was its uninspired camera-work, plus how long it took for the narrative to take shape. Well, with some benefit of hindsight, I'd say the structure of this piece was rather unbalanced in prose. 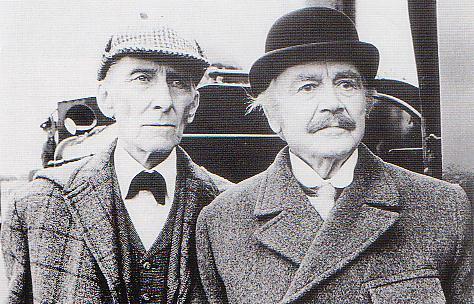 It started off with Sherlock and Watson investigating the strange death of a lonely beggar. It suddenly took a sharp turn elsewhere, when they were then propositioned with another mystery involving a missing German prince. And after that, Sherlock finally cottoned on that the second crime is nothing more than a ploy to steer him away from the first crime, and... errr... bosh-bosh-bosh, slap-slap-slap, Bob's your Uncle, and Fannies your Aunt. Another aspect about this movie I enjoyed was the obvious on-screen chemistry between its two main leads. Even though you could tell Peter and John were getting on in age, in my opinion I still thought they worked very well together, because on occasion I could almost feel the tangible quality these two great actors had between them. Furthermore, I couldn't help but applaud the fact that they didn't point to their own frailties, and just got on with the matter at hand like pros always do. Yeah. Straight Up, folks! Despite being in his seventies, Sherlock still played dress-up and messed about with his chemistry set. Whilst Watson narrated this piece, and always carried around with him his usual trusted revolver. Granted, I wasn't too sure what role the Irene Adler character had within the scheme of things. The way I see it her main role was as a 'sounding board' to highlight Sherlock's past failures. But apart from that slight dip -- nah! -- this is a very good film to follow. And these are its filmic-facts. (1) 'Tyburn Film Productions Limited' first screened this televised movie on exactly the same day the Sicilian Mafia bombed a train travelling from Napels to Milan, killing 17, and injuring 267. It was on the 23rd of December, 1984. (2) The majority of this movie was shot at the prestigious 'Twickenham Film Studios', as well as throughout numerous parts of Buckinghamshire and London. (3) Sir John Gielgud was originally going to play 'The Home Secretary' in this adventure, but he was replaced by Ray Milland because of his ailing health. (4) That nice English chap who directed this picture, Roy Ward Baker, has also directed such popular television series as 'The Saint', 'The Persuaders! ', 'The Champions', plus 'Minder'. 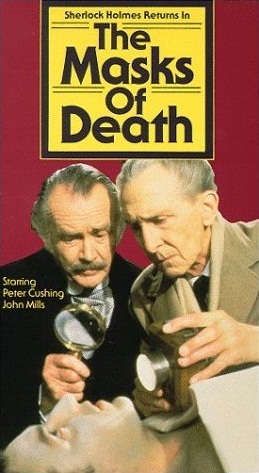 (5) Peter Cushing played Sherlock Holmes twice prior to starring in this flick. First during the 1960's in 16 episodes' developed by the BBC. And secondly, in 'Hammer Houses' 1959 rendition of 'The Hound of the Baskervilles'. (6) I'm afraid to say that this was the last screen performance from the American film actress, Anne Baxter. (7) According to Kevin Francis, who was one of the producers associated with this film, there was going to be a follow-up TV movie made afterwards called 'The Abbot's Cry'. 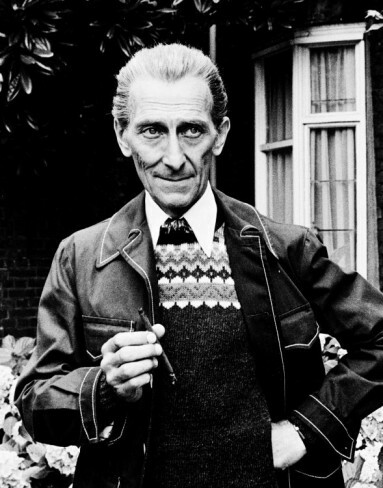 But ultimately it was quashed due to Peter Cushing's infirmed state. (8) After this adventure trundled off to the nursing home, Peter Cushing starred in the family-flick, 'Biggles: Adventures in Time'; John Mills starred in the mini-series, 'A Woman of Substance'; and Ray Milland starred in the nautical-thriller, 'The Sea Serpent'. Overall I'd say 'The Mask of Death' was a pretty decent film to sit down and watch. By in large all the actors helped drive the plot along quite nicely. The plot was easy to follow despite its sudden turn. And as push come to shove, I would defiantly recommend this movie to any of you Sherlock Holmes fans out there. It may not be the best mystery you'd ever see. But it surely is one of a kind. Nuff said.